BAYTOWN AND LIBERTY, TX — Distracted drivers are responsible for approximately nine deaths and more than 1,000 injuries each day, according to the National Center for Statistics and Analysis. In efforts to educate the community and provide greater insight into the consequences of driving while distracted, the Risk Management Institute at Lee College will provide a free Distracted Driving Course. The National Safety Council Distracted Driving Course, provided by the National Safety Council, will change drivers’ behavior and attitudes about distracted driving. The course intends to decrease the number of vehicle collisions in the community. The course is free to attend and open to the public, including employers, employees, students, adults, and young drivers. The Risk Management Institute will hold the class at both the Baytown and Liberty locations. Seating is limited, and registration is required. To register for the class, call 281.425.6311 or register online at www.lee.edu/rmi/. This course is informative and engaging, and has an interactive format to educate participants about the science of distracted driving, myths about multitasking, impact of distracted driving, financial and legal ramifications, state and federal laws, and much more. Companies with employees who operate vehicles, as well as parents with driving-aged children, are encouraged to attend. A certificate of completion is provided after successfully completing the course. This training is not admissible for ticket dismissals. UPDATE (Oct. 13, 2017): The event in Liberty has been cancelled. BAYTOWN and LIBERTY, TX – The Center for Workforce and Community Development (CWCD) at Lee College will host an open house for the debut of its Risk Management Institute. Thanks to a generous donation by Texas Mutual Insurance Company, the Risk Management Institute was created to offer free seminars, workshops, and safety training classes on health and safety for employers, employees, seniors, and the general public. The Institute’s tagline touts, “You are priceless. Safety knowledge is free,” and reflects the Institute’s goal of providing free safety education for the Baytown area and surrounding communities. Members of the media are welcome and encouraged to attend. Details: The open house will celebrate the opening of the Risk Management Institute. Door prizes will be available and refreshments will be served. Immediately following the open house, the CWCD will provide a “Safety First” workshop from 11 a.m.-12 p.m., with instructors from Lowe’s Home Improvement. Seating is limited, and registration is required. To register for the event, call 281.425.6311 or register online at www.lee.edu/rmi. The CWCD will also host an open house at its South Liberty County location. Immediately following that event, the institute will provide a “Rebuilding – How To and Where to Start” workshop from 11 a.m.-12 p.m., with instructors from Lowe’s Home Improvement. Industry leaders, personnel, students, and the general public affected by Hurricane Harvey are encouraged to attend this free course. Seating is limited, and registration is required. To register for the event, call 281.425.6311 or register online at www.lee.edu/rmi. BAYTOWN, TX — The Lee College Education Center — South Liberty County is hosting a free event Thursday, April 6, where prospective students can jump-start their college careers by learning more about applying for financial aid and scholarships, enrolling in the innovative Weekend College and completing mandatory vaccinations. The “Take Command of Your Future” event will be held from 5:30-7:30 p.m., at the Lee College Education Center – South Liberty County, located at 1715 Highway 146 Bypass in Liberty. Participants will get a wide range of assistance to prepare for registration for the Fall 2017 semester, which opens May 2. Lee College staff will be available to help families complete the Free Application for Federal Student Aid (FAFSA) that determines their eligibility for a wide range of federal grants, loans and work-study funds for college students. Staff will also help students apply for scholarships, and eligible students can receive a meningitis vaccine at no cost. Vaccination is required for all students under 22 years of age who plan to attend any community college or university in Texas. In addition, parents and students at the event can learn more about enrolling in Lee College’s Weekend College, where students can earn an associate’s degree in less than two years by attending classes only on Friday evenings and Saturdays. Designed to cater to the unique needs of adult learners and working students who have to juggle school with other responsibilities, the Weekend College includes five program options: General Studies — Transfer in Allied Health, General Studies — Social Science Concentration, Business Administration and Management, Industrial Welding Technology and Computer and Network Maintenance Technology. For more information about the Take Command of Your Future event and preparing for the Fall 2017 semester, contact the Lee College Education Center – South Liberty County at 832.556.5660. 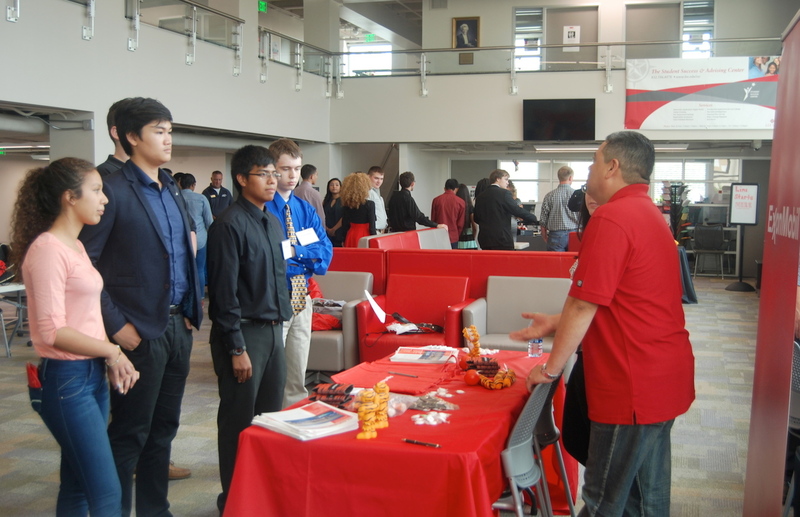 Local high-school students attending this summer the J.P. Morgan Chase College and Career Institute at Lee College network with representatives from Chevron Phillips Chemical Co., Covestro, ExxonMobil and Noltex at a mock career fair held at the main campus in Baytown. The institute included a variety of career and college exploration activities and was sponsored in partnership with Workforce Solutions and Project GRAD Houston, an organization that aims to help students develop and achieve their educational aspirations. BAYTOWN, TX — More than two dozen high school students from the Dayton, Hardin and Liberty school districts spent a week at the Lee College Education Center – South Liberty County this summer to attend the J.P. Morgan Chase College and Career Institute, a program sponsored by Project GRAD Houston to help young people start on the path toward a high-wage, high-skill and high-demand career. Project GRAD Houston aims to improve lives in low-income communities by helping students develop and achieve their educational aspirations. As part of the effort, the program offers college institutes each summer for 1,000 scholars across the Houston area. The J.P. Morgan Chase College and Career Institute at Lee College was also sponsored in partnership with Workforce Solutions. Lee College hosted the majority of the institute at its new education center in South Liberty County, where faculty gave students an inside look at programs in electrical technology, process technology, logistics, computer-aided drafting and engineering technology. They learned about the hard and soft skills that employers want to see in job candidates, and picked up tips about networking and proper presentation. The students also took field trips to regional manufacturing facilities and spent their final evening at the main campus in Baytown, participating in a mock career fair with representatives from Chevron Phillips Chemical Co., Covestro, ExxonMobil and Noltex. Robert Bird, a rising senior at Liberty High School, was announced the lucky winner of a $500 scholarship at the institute’s closing ceremony. 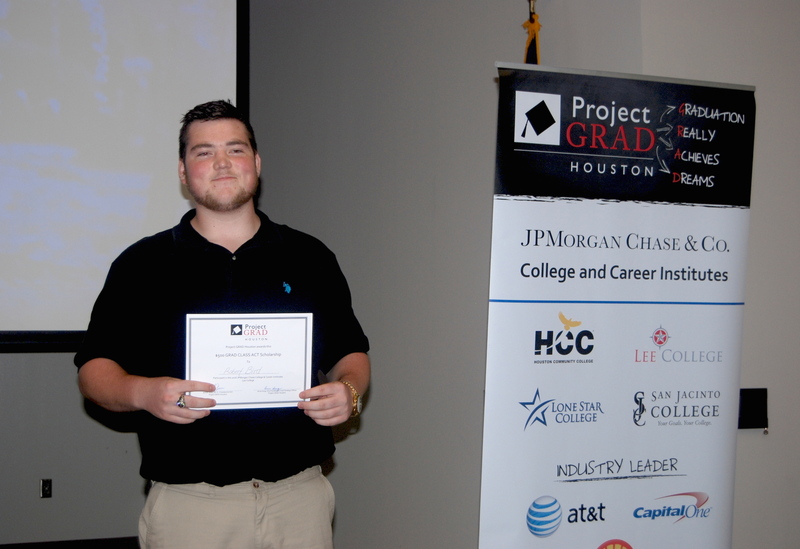 Scholarship winner Robert Bird: Robert Bird, a rising senior at Liberty High School, receives a $500 scholarship at the closing ceremony for the J.P. Morgan Chase College and Career Institute at Lee College. The institute included career and college exploration activities for high-school students and was sponsored in partnership with Workforce Solutions and Project GRAD Houston, an organization that aims to help students develop and achieve their educational aspirations. Students at the institute developed 30-second commercials about themselves for potential employers and produced videos detailing their future educational and career goals. Adam Percy, a rising sophomore at Liberty High School who aspires to be a lawyer, volunteered to share his commercial live on stage at the closing ceremony and said he learned valuable lessons by participating in the program. When he had his opportunity to speak with process operators from Chevron Phillips at the mock career fair, he felt confident about how to approach and what to say. “Go to school while you can, and always do the best you can,” Percy said. BAYTOWN, TX – Lee College invites the community to a free open house at the new Lee College Education Center — South Liberty County to explore the campus and learn more about the classes, camps, and programs offered there. The open house will be held 10 a.m.-2 p.m., Saturday, June 11, at the education center at 1715 Highway 146 Bypass in Liberty. Participants will enjoy free food, giveaways, raffle drawings, and the chance to meet the Runnin’ Rebels basketball team. Get important information about how to begin the enrollment and registration process for credit and non-credit classes, community education courses, summer camps, teaching opportunities, and more available at the center this summer and fall. Representatives from Lee College academic and technical programs and the offices of Outreach and Recruitment, Student Career and Employment and Student Success will be available to answer questions and share details about resources and services. Prospective students can learn which college courses and degree programs they can take at the South Liberty County education center, and parents can learn more about the Dual-Credit Institute, which allows students in five neighboring school districts — Anahuac, Dayton, Liberty, Hardin and Hull-Daisetta — to earn a college credential by the time they graduate from high school. The Lee College Education Center — South Liberty County opened in January to advance the college’s commitment to enhance the academic resources and workforce training offered throughout the region by providing a wide range of programs for students of all ages. Summer classes will begin June 20 and run through Aug. 12. BAYTOWN, TX — The Lee College Education Center of South Liberty County is hosting credit and non-credit classes this summer, and interested students can receive help from college staff for the application and enrollment process. Transition specialists will be on site at the center from 8 a.m.-7 p.m., this Tuesday, May 31, to answer questions and to offer assistance with applications. The center is located at 1715 Highway 146 Bypass in Liberty. If students complete applications on May 31, the college will provide the steps necessary to enroll in classes at the South Liberty County education center over the following two weeks. Those who submit applications after May 31 will need to complete their enrollment at the main Lee College campus in Baytown. The deadline to submit applications for the summer semester at the South Liberty County education center is Saturday, June 11, during the free open house that will be held from 10 a.m.-2 p.m. Summer classes will run from June 20 through Aug. 12. For more information about applying and enrolling for the summer semester at the Lee College Education Center of South Liberty County, contact Katie Marek at 832.556.5616.